Serpent, serpens, serpere: to creep or as in the bible a serpent referrers to a creature that tempted Eve and is the form of Satan. Omega: often used to denote the last, the end or the ultimate limit as in Alpha and Omega the beginning and the end. 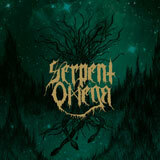 Two fitting words to describe Serpent Omega, a Doom/Sludge/Stoner band from Stockholm, Sweden who in my mind hint at those genres but are doing it in their own unique style. Formed in 2011 this heavy hitting foursome have created a slab of music that brings to mind many bands yet simultaneously refreshingly different, which is mainly due to the vocal style of front-woman Pia Hogberg. Whose courser than Sahara sand vocals are at the same time very distinguishable with every line clearly heard, which cannot be said for some bands in this style. So onto the album, and it opens up with Skullwand and kicks off almost instantly with a crunching riff that knocks you sideways with a tone most would kill for or have! There is a real swagger to this opening song and makes their intentions heard right away. Smoke Ritual, the longest track on the record, is next and carries on in the same way rumbling like a juggernaut running over everything in its path, vocals soaring like a crow on a Swedish winter’s night and in my view the best on the album, they compliment the guitars perfectly. Black metal tinged Hammer hits hard next with its sludge and intricate guitar work and does what it says on the tin: beats you to a pulp with a mallet to the brain whilst some great solo work plays out to trick the senses. This is a band that sticks to a formula and it really works for them, some bands get a tad boring playing the same riff for what feels like eternity but with Serpent Omega the songs never outstay their welcome. If I can have one negative, the tracks probably in some cases don’t go on long enough but for this band we don’t need a Dopesmoker epic of an album; quick, heavy inhales are what the doctor ordered if not just as potent. Album closer Kornflux has a real menace to it, something lurking in the background much akin to a snake in the grass and you never know where this beast will go, twisting and turning all the time but making its intentions perfectly clear. I love the way they are not afraid to slow a song down or go off on a completely different direction for a bit then bring it back again just as crushing as it was in the first place. This slippery cold blooded album adapts to its environment perfectly. And so the album fades into a wall of drums like an army retiring from war victorious, their enemies slain and you too could be defeated by Serpent Omega, you just might like it as much as I did.